Authentic Spanish tapas. Trendy pinchobar De Zwarte Vosch sticks to the motto "eating together". Enjoy the varying pinchos, raciones, wines, cavas and beers together with your friends or family. All the products are being imported straight from Spain. We had very good time there , we stop by there before going for our team Christmas dinner - good service, good wine and food, nice music. Recommend the place to visit. Very enjoyable evening for a small business group. We went to Zwarte Vosch for date night and enjoyed it very much. The food was prepared extremely well and every dish we tried (a total of six) had lots of flavor. We lost track of the cost because of the multiple small plates, but the final bill was reasonable for the excellent food quality. We also enjoyed the delicious IPA from the tap. I enjoyed the option of little cold tasters with ability to order warm food. 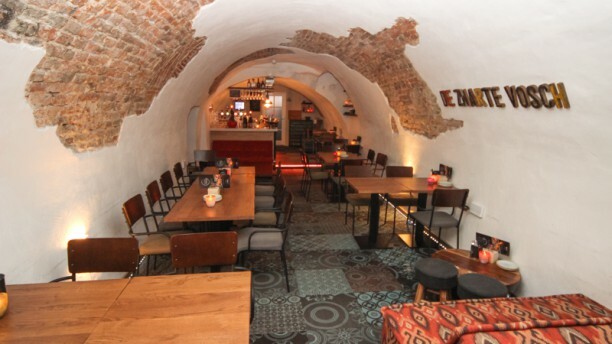 Understood it's a little pricy, but you get a relatively cosy environment in a good location and great flavours. Slightly over salted for my tastes. Service was welcoming. I ate early so hard to comment on atmosphere. Great atmosphere, good food and friendly people. One of the very few places right by the canal (Oudegracht) that doesn’t compromise on quality! We always thought the food was good, but this time it was even tastier, fresher and surprising! Nice restaurant, good staff, and good food. The Lamb with yogurt is very good. Pulpo a Galicia is ok, and the portion is very small. Croquetas de gamba not worth it. The other pinchos are also not great. The price is expensive for what they offer, Anyway is a good option for a dinner since there are not many good restaurants in Utrecht. It is good food and good service. But it is higher price than normal tapas and price quality is bit questionable. Hi Hyesun, thanks for your review! Our prices are a little bit higher than in other tapasrestaurants, we work with high quality of products that's why the prices are a bit higher. We're glad that you enjoyed your stay with us and looking forward to see you again! Great place! Besides the fact that you can order tapas from the menu, they walk around with interesting tapas, and you can chose to try one when they come by you table. Also very friendly staff and great atmosphere. Thanks for your review Hannes! We're glad to hear that you enjoyed your night with us! Hope to see you soon! Wat een mooie reactie! We geven het door aan het keukenteam! Dank je wel en tot gauw! Very good food and service! Great location in the center of utrecht. Cosy environment with candles and flowers. Super nice staff and reasonable price. Delicious food. Lots of vegetarian options. Great atmosphere. Superb service. Make sure you try the pinchos - they are really different and fresh. The sangria is freshly made and some of the best I've had. Thank-you for a lovely evening! Food was fantastic and the staff super friendly. The location was fantastic! The terrace will be beautiful in the summer. Great food and atmosphere. The service was really kind, and the music was correct. Perfect concept with the pinchos at the spanish style. for sure I will come back. Pinches are good and tasty. Service is friendly and easygoing! I love they are pet lovers and my dog can be with me. 1. The pincho of tortilla espanola is not that good still. I love tortilla espanola and it doesn't hit the mark yet. 2. Gambas al jail were swimming in oil. I believe this is not the proper way to cook them. 3. Patatas bravas are not frietjes with alioli. Please don't get lazy and prepare proper patatas bravas!